J. Warner Wallace examines the classic problem of evil and offers a cumulative case response. In this first of several related broadcasts, J. Warner examines the role eternity and free agency play in helping understand why an all-powerful, all-loving God would allow evil to exist in the universe. 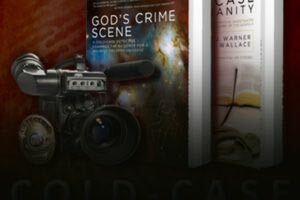 For more information about the cumulative case for the existence of God and the problem of evil, see J. Warner’s latest book, God’s Crime Scene. J. Warner Wallace takes questions from an audience at a Fearless Faith seminar (he is accompanied by Frank Turek and Mike Adams). Together they answer: Can a Christian lose their salvation? How do we respond to people who believe in conspiracy theories as they apply to the Church? Can evolution explain objective morality? How do you start a conversation about the Gospel with your atheist friend? What can Christian students do when they are mistreated by biased professors? Does God control the future or do we have the freedom to change it? J. Warner Wallace completes his talk on the problem of evil. Are there good reasons why an all-powerful, all-loving God would allow his creation to suffer, or does evil demonstrate that God doesn’t exist? J. Warner Wallace takes questions from an audience at a Fearless Faith seminar (he is accompanied by Frank Turek and Mike Adams). Together they answer: How do you deal with people who don’t want to hear about God? How do we interact with people in our current culture? If God created the universe, who created God? You say there are only three reasons behind any sin, but aren’t there more? How do we know that we can rely on the documents we cite to demonstrate the reliability of the Bible? How do you know when you’re wasting your time sharing the gospel with someone (i.e. you’re “casting your pearls before swine”)? My professor said that people in this area only believe in Christianity because they were raised that way; how am I supposed to respond to that? J. Warner Wallace examines the way in which Jesus is described by the world’s other religious systems. What role does Jesus play in these belief systems and how is He characterized? If Jesus is venerated or described accurately by these world religions, shouldn’t seekers examine Christianity as their primary focus? J. Warner Wallace is interviewed by Lee Strobel and describes the investigative template he used to investigate the reliability of the New Testament Gospels. Can we have confidence the Gospels are telling us the truth about Jesus? How can we be sure? J. Warner Wallace begins to tackle the problem of evil. Why would an all-powerful, all-loving God allow evil t occur in His creation? Does the existence of evil eliminate God as a reasonable explanation for other evidence in the universe? J. Warner Wallace examines the case for the Resurrection of Jesus using “abductive reasoning” to determine the most reasonable explanation for the first century evidence described in the New Testament. Is the Resurrection reasonable, and if so, what keeps everyone from accepting the claims of the Biblical authors? J. Warner offers a key reason skeptics reject the Resurrection of Jesus. J. Warner Wallace describes the ancient non-Christian evidence for the life of Jesus. What would we know about Jesus if we lost every possible Christian document (including the New Testament and writings of the Church Fathers)? What would the earliest unfriendly Greek, Roman, Syrian and Jewish historical documents tell us about Jesus? There you have it: the 10 most popular broadcasts of 2016. If you’ve missed some of the content here at ColdCaseChristianity.com, now is the time to catch up. Enjoy!